Every day at the American Craft Council, we see how craft – the simple act of making – adds meaning to the world. In a mass-produced era, careful craftsmanship immeasurably enriches everyday life. Skill, quality, and creativity strengthen our economy, while preserving tradition and advancing culture. That’s why, for this heritage-printed poster series, we sought out partners – a printer, paper maker, designer, and writers – who share our understanding. The February/March issue of American Craft featured the first of nine posters celebrating 75 years of skill and creativity. 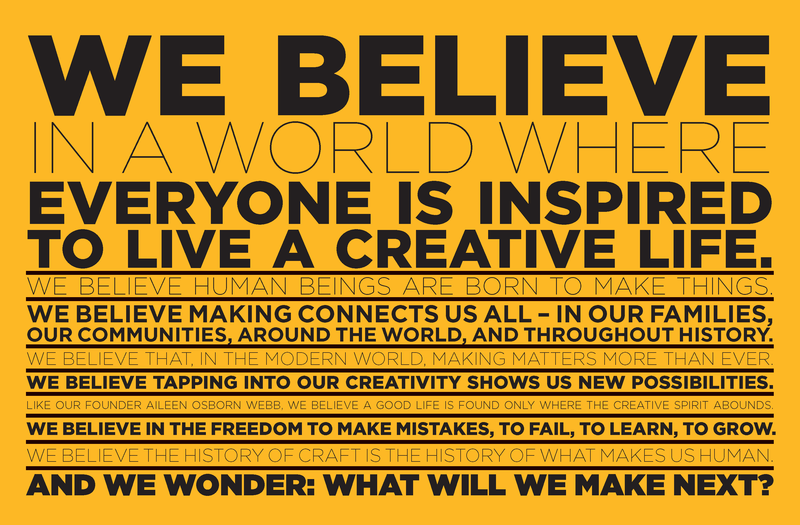 The first includes our making manifesto, pictured above. Starting with the April/May issue, each limited-edition poster also folds out into a timeline commemorating one decade of craft history, all the way back to the American Craft Council's founding in the early 1940s. If you missed an issue or want additional copies, we've got you covered. You can purchase single copies of each magazine issue featuring the posters, or take advantage of our special pricing on a full set of issues with all nine. Want to explore more craft history? We built an interactive timeline with even more events than you'll find in the magazine. Learn more about the seminal events and figures that shaped the craft world. Since 1931 Mohawk has been making the finest textured and colored printing papers in our Upstate New York mills with time-tested methods, the highest-quality materials, and meticulous craftsmanship. Generations of designers and artists have trusted Mohawk papers for their most important work, recognizing how finely crafted paper makes every printed project more beautiful, effective, and memorable. Shapco has been relentlessly perfecting the craft of fine printing since it opened its doors in 1975. Today, we are the leader in the printing industry. Whether we’re printing for a high-end art gallery, the music industry, or a four-star restaurant – or creating basic business cards and brochures – our clients rely on us to approach each job, large or small, with an artist’s eye. We promise to deliver the quality that clients crave, and that sets Shapco apart. Special thanks to Quad Graphics for inserting the posters into American Craft magazine.